Many of us are familiar with the name George Eldon Ladd, a leading evangelical scholar of his times and professor at Fuller seminary for some 25 years—the guy who taught so many of us about the kingdom of God and eschatology, himself a Historic Premillennialist. We were never called to be people-pleasers. As fine a scholar as George Eldon Ladd was, he never quite learned that lesson. This entry was posted in Eschatology, George Eldon Ladd, Kingdom, Premillennialism and tagged Eschatology, George Eldon Ladd, Historic Premillennialism, Kingdom of God. Bookmark the permalink. Wow, did not realise this. I love his little book The Gospel of the Kingdom. I quote him a lot when talking about the kingdom of God. This shows none of us are impervious to temptation. The biggest temptation for us as ministers me thinks! I heard he suffered from severe mental illness but I didn’t realise it was this bad. I guess God uses us all in spite of our failings. Yeah, this came as a revelation to me as well. I agree with you. But Ladd wanted so bad to be accepted by liberals, that he neglected his family and so forth. Not good. Reminds me of A.W. Tozer also. Does this affect what we think of their work? Just curious, Jeff–how does this remind you of Tozer? Barry, word came out that Tozer neglected his family and others. So this reminded me of him. One who did work that changed other people’s lives but had surprising weaknesses in their own, as we all do. Not really, but one has to wonder how much harder he had to work to please his peers and especially his liberal critics, who were in turn critics of evangelicalism. What a sad way to be remembered. Just another good example of how even the most brilliant and articulate thinkers are not exempt from the clutches of depravity. It’s so sad that such a great theologian struggled so mightily with everyday life. Your point is very well taken, but I also think we’re being a bit harsh. He opened doors for so many evangelicals afterwards that if not for men like him, I don’t even know that we’d even be around right now. 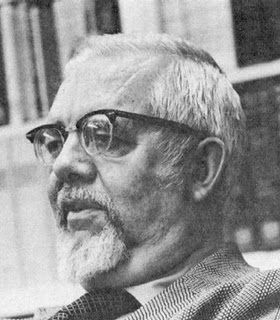 Though there is no excuse for the kind of obsession that he displayed in his pursuit of scholarly acceptance, his sacrifice (be it selfish or altruistic) did play a role in dislodging members of the evangelical right from its home in anti-intellectual fundamentalism, whereby now we have men and women who are evangelicals, but are also very intelligent, critically-sound, and methodologically rigorous making valuable contributions in scholarship. I’m not giving Ladd a break for what he failed to do (i.e., family, drinking, etc. ), but I also want to give him credit for the things that he did as a scholar. If what is outlined above is true, his struggles were self-inflicted. And I’m saddened by the knowledge of it. I’m not giving Ladd a break for what he failed to do (i.e., family, drinking, etc. ), but I also want to give him credit for the things that he did as a scholar. Yes, credit must be given. But I think we have valuable lessons to take away here. Let me see if I get this, because I’m not following something in your past few posts. Drink to your heart’s content as long as you do it to the glory of God. Fail your wife by having a homosexual affair, buck church discipline, but let the guy preach. But when you die, and are long gone, look out. Blogs will bash you for how you apparently finished in life. If you live for the praises of man you’ll die by their criticisms! How people finish is a tragedy but it doesn’t affect whatsoever their annointed writings. If that was the case we’d have to throw away portions of the Bible! Thats why it drives me mad when a man or woman falls and so many people jump on a bandwagon and use that to completely discredit their ministry, completely unfair. I’m forever grateful for Ladd’s scholarly contribution. I don’t think you can conclude otherwise from my post and previous comments. Regarding reflections on a man after he is dead, it’s nothing new. You know that. I don’t think we should discredit the content of the man’s work. His works on the kingdom and eschatology are among the finest. My point is your inconsistency. You tank a dead man and allow a “gimme” for one still living who hasn’t contributed nearly as much. My post in no way serves to frustrate the work of Ladd. But his shortcomings, which were self-inflicted, serve as examples for those us who are tempted to be people-pleasers at all costs. I really do not see this “inconsistency” of which you speak. So, when do you slam Haggard? After he is dead? It’s fine. I just find your evaluation inconsistent. Haggard has no “cautionary tale” from you, but Ladd does. Haggard has plenty of background info available. Ladd’s evaluation comes from a blog post. The details of the end of his life aren’t nearly as well-documented as Haggard’s current situation. Yet, you find grace for Haggard without the cautionary tale while you readily take one blog post and use it to deliver (a needed) caution concerning Ladd. Certainly posthumous reflections are done. The founder of World Vision has a whole book written by one of his children detailing his intense personal struggles. I just think both situations offer “cautionary remarks” and you chose not to do so. I’m sorry it wasn’t clear where the quote came from. The quote came from a review done by respected blogger Trevin Wax of At A Table, a recent book (2008). The review was posted on Amazon.com. Both emphases are different in both posts. Also, I mentioned what happened to Mr. Haggard a few years ago, but that wasn’t my emphasis, so I didn’t need to dwell on it. I AM another G.E. Ladd! Now what would I mean by that? I read Ladd’s “The Blessed Hope” while attending an AG Bible college, which convinced me that dispensationalism was essentially a fairy tale. I took on a post-tribulational view of the rapture. Not long later, I became amillennial. In 1981 I consulted with one of the AG’s top theologians and one of my professors, Stanley Horton, who is still alive. Talking with him about my non-AG views, I learned I had no future in the AG. I left college, the denomination, and “Christianity” (or at least the organized part of it) for 18 years. I became an alcoholic. I returned to faith eleven years ago, and my alcoholism has been in the past tense for five years. I recall the intense debates about eschatology that happened back-in-the-day at my AG college. Spiritual warfare was happening. It was “thick.” You could feel it! But of course, these days, we’re much more accepting on “secondary, non-essential doctrinal differences.” Don’t get me wrong – I don’t require folks believe exactly-as-I-do for fellowship. However, I CRINGE every time I see John Hagee’s “info-mercials” that support Israel no matter what it does. TBN broadcasts go into Muslim nations – and many Muslims there equate Hagee’s version of Christianity with the USA’s. (Not only is Hagee’s dispensational theology wrong – it’s DANGEROUS). My entire family is dispensational. Eschatology has become one of those topics we’ve decided to not discuss. They can’t understand why their beliefs offend me (and it’s beyond me why they can’t). So, I know I’m kind of ranting here. Well, I am. And don’t know if my post will get published. (I could understand why, if it won’t be). This, in my mind, shows that Ladd was probably repentant. Also,I see nothing “sinful” in a person (such as Ladd) wanting recognition among his peers or colleague, regardless of their theological perusation. Ladd was in spiritual battle of the doctrinal variety. I read his work in 1980 (when he had his stroke), left the AG and the organized part of “Christianity” in 1981, and was on my way to becoming a full-blown alcoholic by 1982 (the year Ladd died). I can’t help but see the parallels in Ladd’s life and mine. I apologize for being somewhat melodramatic, but I still feel as intensely about these things as I did in 1981. Thanks for sharing. Well, I praise God and celebrate your five years of sobriety. It’s unfortunate what happened in your earlier years with your denomination. Many denominations were exactly like that, but most have since change, being more accommodating. I do not Ladd’s salvation. To some extent it’s fine to receive the recognition of your peers, but to what extent will a person go. It seems like Ladd went too far. Thanks for the congratualtions on my sobriety and for publishing my post (typos & all). I must add that God got me sober when A.A. couldn’t (but that’s another story). I should read Ladd’s bio, as well as Stanley Horton’s, who I just befriended on Facebook (having recently learned he’s on there). When I signed-up I was really excited about talking with him again (in 1981 he was ten years older than I am now)! But…now I can’t think of what to ask him…or what to say. Getting back to Ladd. He was one of the few voices (back then) speaking a ‘different view’ on eschatology. Robert Gundry was another, and I can’t recall many more. I can say G.E. Ladd changed my life! and kept me out of the ministry in the AG! I leave with an excerpt from a 1999 interview with Stanley Horton – Loyalties and Labels . . .
Coffee Talk: Are you a loyal person? To what are you loyal? Why? Horton: One thing that no one expects, or at least no one should expect it, is blind loyalty. As Christians, we are to be loyal to God, of course, in all things. However, to our co-laborers in the vineyard of the Lord, we are to be loyal only as long as our fellow Christians live lives worthy of being loyal to, and we are to be loyal to a certain theological system as far as it aligns with truth. I understand Dr. Horton has dropped the Classical Pentecostal position that speaking in tongues is “the initial, physical evidence of the Baptism in the Holy Spirit.” I may work on him to become “post-trib.” Or maybe not. I have no idea what I’m saying now. I suppose that Ladd, Horton, and myself remained loyal to what we thought the Bible teachest, regardless of what others say. Well, I believe we need to learn how to keep an open-hand on nonessential issues. May God continue to keep you by his grace as you continue to trust him. Wow! no comments since July! People must not be interested in the sins of those already gone. I do want to point out that George Ladd held a heretical view on the resurrection of Christ…spiritual rather than material…and pretty much had his views of eschatology dashed by John Walvoord’ s book on the Millennium. He never could get past the difference in the ‘church’ and ‘Israel’ not being the same entity. Oh well, I guess he knows better now! James, if you were familiar with blogs you would know that people don’t comment on posts indefinitely. There may be a discussion on a post and then people move on to the next discussion. Nobody except those who are subscribed to the comments of this post will see your comment. You would be spending your time better on posts that were written later than last year. I know I’m not supposed to respond to trolls but I thought I’d help him out. Yes, feet of clay, but should we consciously imitate the moral weaknesses of others? It has been too long! How are you, my friend? Life has been rough, but of course, God is good. What are you up to, in a sentence or two. Or how have you been? Been here and there, wherever the Lord saw fit to plant my family and I.
I miss your blog and you on Facebook. God bless you wherever he has you. Sorry about FB, but I’m still blogging here, though not as often as before. Thanks for the blessings, my friend – the same to you as well. I must not have you in my feed. I’ll look into that. Thanks. I am very interested in this discussion of Professor Ladd’s life. I wish to offer an additional perspective. I trained at an Evangelical college in Melbourne, Australia in the 1970’s. One of our lecturers had been studying at Fuller some years previously and he recounted the following anecdote. I understand he was attending a post graduate seminar conducted by Prof Ladd. I have found the last few words very helpful when looking at the so called “moral failings” of others. I always thought it was much better to be down the back of the synagogue than standing up the front.